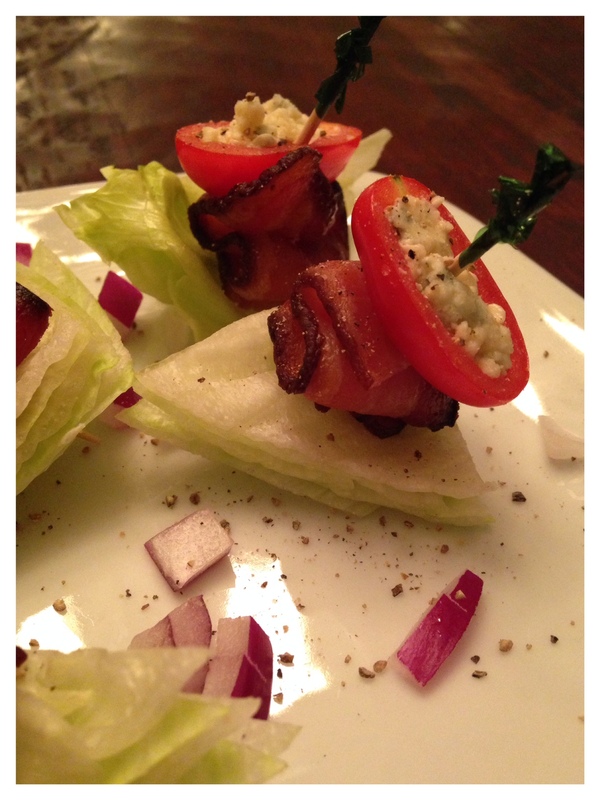 Mini Iceberg Wedge Salads with Bacon Ribbons | Kitchenpants! Ok, so this is more of a lifehack than a recipe, I think….but, whatever. I love (LOVE!) a good wedge salad and for the longest time, I have been trying to figure out how to make an hors d’oeuvre sized wedge (and no, I didn’t just make it easy on myself and look on Pinterest because that’s cheating, and I don’t have a Pinterest account anyway). The issue for me was always the bacon: How do I get the bacon to stay put? The answer dawned on me as I was tying my shoes for a run. I should mention that I am probably one of the only people on Earth who actually thinks about tying her shoe while she ties her shoe because I am woefully awful at tying shoes. I still make the bunny-ears-configuration to tie them, and I will be happy when I get into my 80s and velcro is fashionable. So, anyway, the answer: bacon ribbons. Let’s start there, shall we? Bacon – As much as you like, but use a thick-cut, quality bacon. Cayenne Pepper – This is optional but oh-so-good. Sweet and spicy, everyone! Note: If you are using the ribbons for the wedge recipe, omit the brown sugar and cayenne. Long Bamboo Skewers – You can buy these at Williams-Sonoma or any other kitchen store. 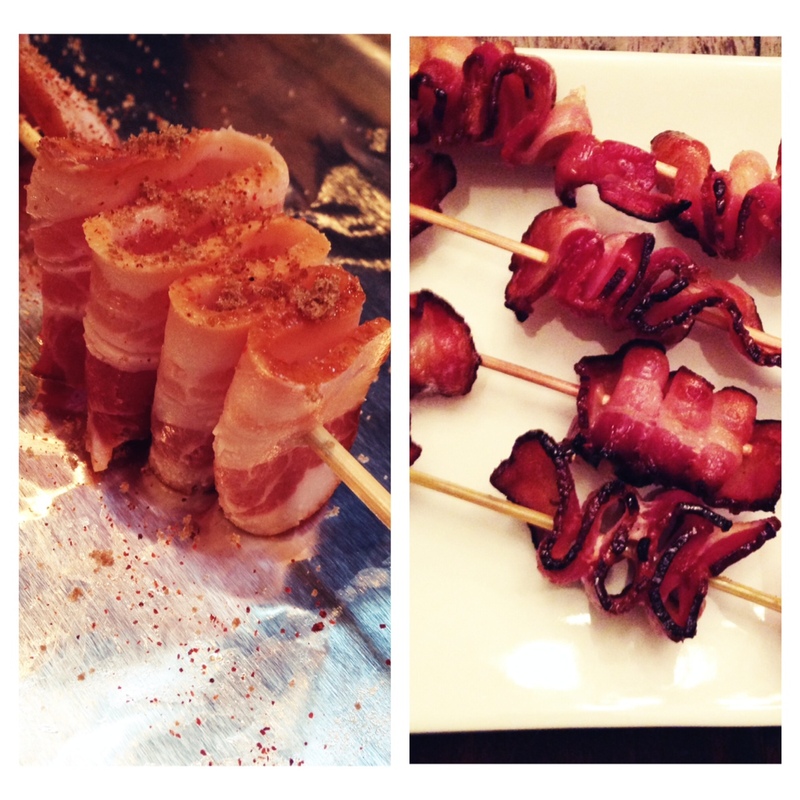 Grab a skewer and thread the bacon onto it like a ribbon candy. You should be able to fit three pieces of bacon on a skewer. Place the bacon on the baking sheet with the fattiest side up. Sprinkle with brown sugar and cayenne. Bake until crisp…about 15 minutes or so…watch it. Remove to a paper towel-covered plate and let the bacon drain a bit. Keep it standing the same way it baked. When the bacon is cool, ease it off of the skewers. You can use the bacon ribbons in the wedge recipe below (omit the brown sugar and cayenne) , but these are versatile! I used one to garnish my Michelada in a previous post. These also make great eyebrows for funny-face pancakes (omit the cayenne, then, or your kids will never eat your food again). You can probably get 20-24 minis out of a single head of lettuce. Bleu Cheese – Crumble it yourself…you can use any bleu that you like. Cut the iceberg head in quarters. Wash and drain each quarter carefully. Pat dry. Using you knife, cut mini triangular wedges from the head. You want a few layers on lettuce for each wedge. Cut each bacon ribbon in half carefully with scissors. Trust me – it is too delicate for a knife. You will need one bacon ribbon for every two wedges. Cut each grape tomato in half and scoop out the seeds. Stuff each tomato half with bleu cheese. You will need one tomato for every two wedges. 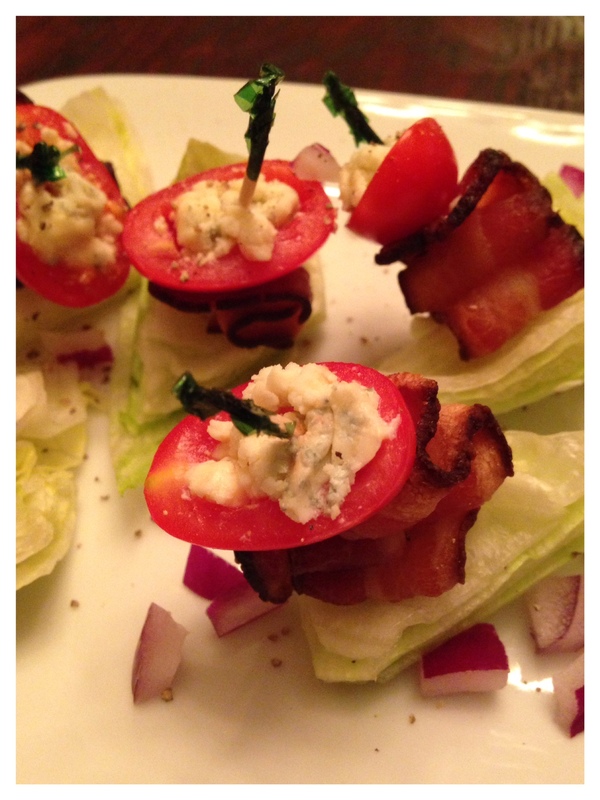 Stack the wedges: Place a bacon ribbon on the wedge and add the stuffed tomato on top. Secure with a toothpick. Place on your serving plate. Garnish with onion bits and black pepper. Add dressing or dip on the side.